In March, for my birthday, friends and family gave me a kindle. I was over the moon. This device is all I need and I’ve been reading books on the train, at home, at work during break, … I take it everywhere. The device is brilliant, but I’ve been getting more and more annoyed with the service. I’m here to tell you about them so you can fix this. Because I really want this to work. 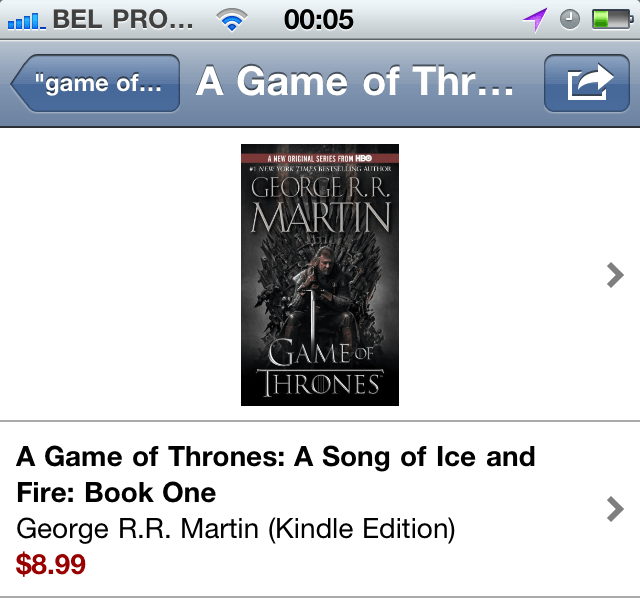 I’m going to give you an example that bundles my griefs: A Game of Thrones: A Song of Ice and Fire: Book One (Kindle Edition, of course). As you can see, the result I get is $8.99. Fair enough. I put the book on my wishlist. When I go to bed, I take my kindle, open my wishlist and see the book priced at $10.57. Straight from my wishlist, Jeff! Same book, same version! I get out of bed (imagine the look on my girlfriend’s face) and get my laptop. On Amazon.com, I find the book for the same $10.57. I don’t get it, Jeff. Why is the iPhone app giving me different prices? Being on the site, I decided to check out another problem I have with the kindle edition and that’s how it compares to paper. I find 2 paperback versions: one at $10.36 and a mass market version at $8.99 (is this where the pricing went wrong?). Both versions are cheaper then the kindle version. I admit, not much, but still. This baffles me. It’s cheaper for me to buy dead trees then a digital format. Now I know there’s some effort to make a good, digital version. I’ve heard from writers I know personally that this requires quite a cost from the publisher. But I just can’t get my head around the fact that this would result in a more expensive book. I will add that I can be persuaded about this so if you can shed a light on why this is, please do. But what makes it worse is that whatever the explanation might be, I’m afraid it won’t fly for this particular book. Have a look at the reviews of the book. Particularly the lower scores. You’ll notice that quite a lot of them are about the kindle edition. The sloppy editing, the ‘rn’ becoming ‘m’ kind of errors one can expect when you quickly scan a document with OCR. Not, however, in a professional digital version of a highly acclaimed book. I know Amazon isn’t necessarily responsible for this, but it does make or break the kindle. And in that regard, you should care about the quality of those books. Head over to some torrent sites and have a look at the quality of illegal books you can get there. It’s amazing, really. The community really strives to deliver. I expect nothing less from a company like yours. Actually, I expect more. I want to give you my money, I really do. So please, fix this. Weird stuff. If they really price Kindle books higher then the regular books it’s pretty faulty and wrong. Would be interesting to to have a official response from Amazon.